1. Make the mushroom powder the night before. 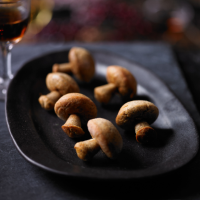 Preheat the oven to 150°C, gas mark 3, and roast the dried mushrooms on a baking tray for 5 minutes, and leave to cool. Then blitz in a small food processor. Pass through a fine sieve and keep in an airtight container until ready to use. 2. For the mushroom purée, place a pan over a medium heat and add enough grapeseed oil to coat the bottom. Add the shallots and cook until translucent. Add the quartered mushrooms and continue to cook until they are caramelised on the outside. 3. Add the mirin to the pan and deglaze, allowing it to simmer for 2 minutes and using a wooden spoon to scrape the bottom of the pan. After 2 more minutes, add the chicken stock. Simmer until the liquid has reduced by two thirds. 4. Remove the pan from the heat and add the soy and sherry vinegar. Transfer the mixture to a tall, cylindrical container and blitz with a hand blender until smooth. Adjust the seasoning with salt and freshly ground black pepper. Pass the purée through a fine sieve and reserve. 5. Mix the flour, salt, mushroom powder and sugar, and sift all this into the bowl of a stand mixer fitted with a dough hook. 6. Place the yeast in a bowl with the milk and allow to stand for 2 minutes. Add this to the bowl of the mixer and begin to mix at medium speed. After a couple of minutes, reduce the speed to low and add the mushroom purée and eggs. 7. Bring the speed back up to medium and continue mixing for 15 minutes, scraping the sides occasionally. Once the dough has come together, add the butter, a couple of pieces at a time, on low speed, mixing after each addition until it disappears into the dough. Continue mixing on medium speed until the dough has come together and is soft and shiny. Place the dough in a container, cover with cling film and refrigerate overnight. 8. With floured hands, shape 9g pieces of dough into balls and place them in 4.5cm diameter half-sphere silicone moulds*. Also shape 3g pieces of dough into small cones and place them in 1.7cm diameter conic silicone moulds*. Cover both sets with clingfilm and let them proof for 20 minutes in a warm place. Meanwhile, preheat the oven to 190°C, gas mark 5. When proofed, place the moulds on a tray and bake for 12 to 15 minutes. 9. Remove the bread from the moulds and transfer to a wire rack. Place the rack in the oven for an additional 3 minutes or until the bread is golden brown. Then remove from the oven and allow to cool. 10. When ready to serve, place the mushroom brioche pieces in a 120°C, gas mark 2 oven for 5 minutes. Remove from the oven. Using a skewer, make a hole on the flatter side of the half sphere (swirling the skewer around to make room for the parfait) and in the top of the cone. 11. Place the blackcurrant preserve in a piping bag with a small tip and place the parfait in a second bag with a larger piping tip. Pipe the parfait, as much as possible, inside the half sphere and the blackcurrant inside the cone. Place the cone into the half sphere through the same hole used to fill it, to assemble your ‘mushrooms’.